Back to our NYC Notes with a few more travel tools, for you traveling tools. Today we will talk restaurants. While I’ve used Zagat, Yelp and Open Table before we got to NYC, I must say that they really shine in a big city with a high density of good restaurants. And when you couple them with Google’s direction capabilities the results are simply amazing. 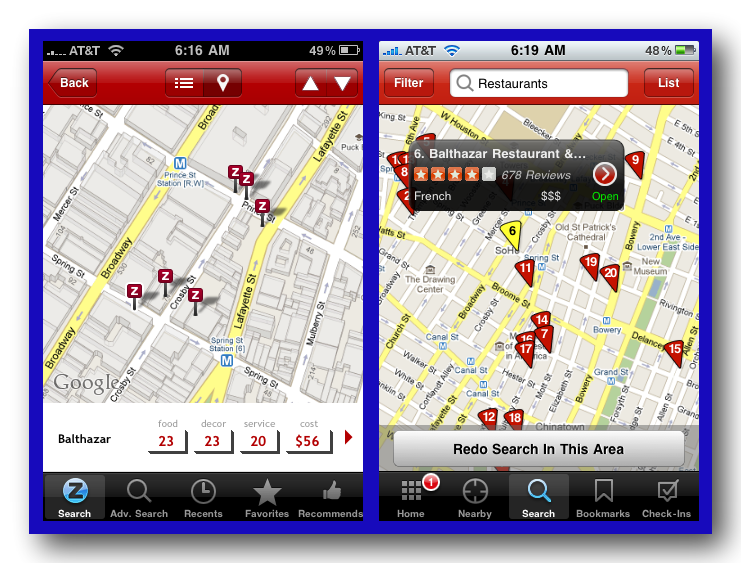 Here is a display of nearby restaurants (based on my GPS iPhone’s location), in both Zagat and Yelp, two popular apps. I’ve clicked on Balthazar, which was on Leslie’s Bucket List, a great place for lunch. Also dinner, but for more $$$. After you click on one of the restaurants in the map display you can read reviews in both apps. Yelp has many more entries than Zagat, but the latter has more structured reviews for easier comparison. Once you’ve identified a few candidates, and read all the reviews, you can go to Open Table and make the reservation. And finally of course Google will direct you to the entrée. Below you can see some available times on Open Table at 10 Downing, another target from Leslie’s Bucket List. They also display a list of other nearby restaurants and their openings. You just click to reserve. There has been some discussion of whether you get the same priority for seating when you use Open Table compared to calling the restaurant directly. I felt like we get better service coming in from Open Table, but that could just be because we were traveling in a better circle of restaurants than we normally do. On the other hand, the restaurant knows you will be solicited by Open Table to review the restaurant after your visit, so that can have some effect. 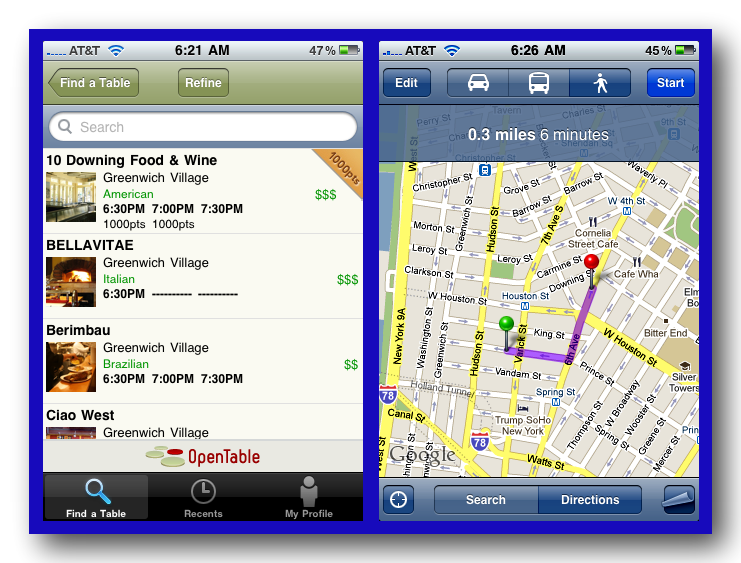 Note that you can make a reservation via Open Table directly from within either Zagat or Yelp, but if you go to the Open Table app itself you will get times for not only your target restaurant but other restaurants in the same area. One of the pluses we got from staying in Soho, was that we could walk to scores of restaurants in just a few minutes. You can see that from Four Points Sheraton Soho where we stayed, that it was only 6 minutes and one turn to 10 Downing via Google. Great time-saving tools, and convenient. Some of my favorite words, speaking as A Tool.